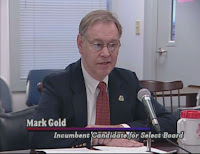 With a commitment to continue to serve Longmeadow residents and bring balance to the select Board, I am announcing that I am seeking reelection to the Longmeadow Select Board for a three year term. Over the next three years the town of Longmeadow will face important issues that include tax rates, water rates, and decisions on major capital projects, and I believe I have the experience, understanding and common sense approach to positively contribute to the resolution of these issues. Since being elected to the Select Board I have demonstrated my commitment to serve the town. I have advocated for maintaining the level of town services that Longmeadow residents have come to expect and holding the line on residential property taxes. I have taken a leadership role in setting the financial plan for Longmeadow, being particularly proud that the Select Board has presented the town with balanced budgets during each of my years on the Select Board. This fiscal control was the result of planning by the select board that maintained the level of town services residents have come to expect. I have been instrumental in several achievements that will have a positive lasting impact on the town, including securing trash hauling contracts that have saved the town tens of thousands of dollars, and defining the surrounding community mitigation settlement with MGM. Through my background as an engineer and my experience on the Select Board I have demonstrated an understanding for the programs and systems of the town and my ability to lead the discussion about each of the issues that the Select Board faces. My wife Ellen and I raised two children who attended Longmeadow public schools and I believe that our 39 years of living in Longmeadow has given me a strong sense of the issues, sensitivities, and characteristics of the town that residents of Longmeadow care most about. I am honored to have been elected to the Select Board by the residents of Longmeadow over the past seven years. I hope that the level judgement and balanced approach to addressing the town’s issues that I have demonstrated resonates with town residents and I ask for their votes this year so I can continue to advocate for the greatest good for all the residents of the town. Almost $10 million of school related expenses are not included in the School Department's annual budget but are instead combined with town related budget line items. Some of these expenses include school department employee/ retiree benefits (health insurance/Medicare, pensions, etc.) that can increase significantly from year to year and which must be covered on the Town side of the budget. Mid-February is the time of the year that the School Committee approves and then submits a School Department budget to the Town Manager. The TM is responsible for creating the Town Budget which is then approved by the Select Board to be voted on at the Annual Town Meeting in early May. Given ever increasing costs and limited increases in town revenue, this process can be difficult. This year the School Committee is considering three budget options as shown below in order to begin a transition to all day FREE kindergarten which is the state is likely to mandate sometime in the near future. Tier I includes FREE full day kindergarten; requires an additional $277,144 in general fund revenues or cuts will need to be made. Tier II includes a full day kindergarten fee of $1,250; requires an additional $155,645 in general fund revenues or cuts will need to be made. Tier III includes a full day kindergarten fee of $2,000; requires an additional $61,895 in general fund revenues or cuts will need to be made. Before deciding which Tier should be chosen, it is useful to consider how the budget is constructed. 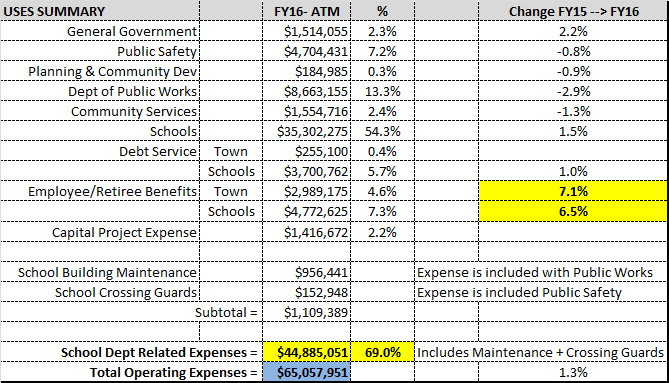 The data used for this example is the current FY2016 budget as it was approved at the Annual Town Meeting last May. It should be noted that the budget numbers change continuously and are not finalized until the fiscal year is over. There are many different sources of income for the town including property taxes, Chapter 70 state aid, water and sewer fees, etc. Table I below shows the sources and amounts of money used to fund the FY2016 budget. Water and sewer are treated as "free standing" Enterprise Funds meaning the fees collected cover the cost of operations including capital projects. 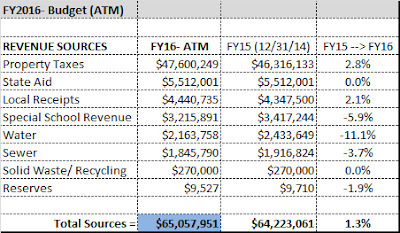 Note that the Total Sources increase from FY15 --> FY 16 was only $506,000 or 1.3%. Increase in Property Taxes was 2.8% or $1.28 million. Increases in Property Taxes are controlled by Proposition 2½ limitations. 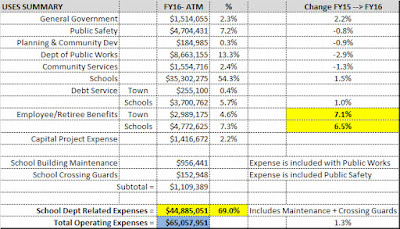 In Table II below is a summary of all of various expenses (or uses) for the Town of Longmeadow. It is interesting to note that the School Department budget as presented at the Annual Town Meeting does not include expenses such as employee/ retiree health care and pension benefits, school maintenance, school crossing guards or debt service (interest + principal on outstanding bonds for school building projects). There was a significant increase in the cost of providing health care/ retiree benefits for school department (and town) employees from FY2015 to FY2016. For school department employees this cost increase was $292K which is a significant amount relative to the increase in annual revenue for the town. At the 2015 Annual Town Meeting the School Department FY2016 budget was presented as $35.3 million. With the additional school department related expenses included, this number increases to $44.9 million, an increase of $9.6 million or 69% of the total town budget. With 2882 students attending Longmeadow schools in FY2016, the cost of educating our children is ~$15,600/year. When asking the Select Board (and taxpayers) for additional money to support new programs, the School Committee should consider the impact of other school department related budget increases that are being covered in the Town side of the budget. There is a Public Hearing on the FY2017 Budget being held by the Longmeadow School Committee on February 9 starting at 7 PM in Room A15 at Longmeadow High School. Here is a link to the FY2017 School Department Budget presentation by School Superintendent Marie Doyle to the School Committee on February 1.